GREENBELT, Md. -- NASA has awarded a sole source contract to Lockheed Martin Space Systems Company (LMSSC) of Greenbelt, Md., for Systems Engineering for In-Space Servicing (SEISS). This cost-plus-fixed-fee, 18-month contract has a value of $31.2 million. LMSSC will provide systems and discipline engineering support to develop and execute two demonstrations to test and verify new robotic servicing capabilities using the Dextre robot aboard the International Space Station. The Canadian Space Agency's Special Purpose Dexterous Manipulator, or Dextre, is a two-armed robotic system designed to perform intricate maintenance and servicing tasks, which previously would have required spacewalks. The first demonstration will use a customized payload task box, Dextre and specialized tools to robotically demonstrate refueling and repair tasks in orbit. Tasks will include locating, accessing and uncapping valves and transferring simulated liquid fuel. During the second demonstration, Dextre will test and evaluate a variety of tools, sensors and instruments to support autonomous rendezvous and capture capabilities for orbiting spacecraft systems. NASA's Goddard Space Flight Center in Greenbelt, Md., is developing both demonstration payloads. These demonstrations are intended to increase NASA's technical capability to conduct robotic in-space servicing. The contract encompasses requirements definition and verification, hardware design, support of flight and ground hardware/software development, and mission planning support. For information about NASA's programs, visit http://www.nasa.gov. In response to the Dec. 22, 2010 Safe Mode event on the Kepler spacecraft, the mission team has brought in several experts and begun a detailed anomaly investigation. The team's initial results are that the Kepler spacecraft appears to be in good condition, and that the on-board fault protection is working as designed. During an initial assessment of the likely source of the anomaly, the team has been able to highlight the circuits most likely to have been involved in causing the safe mode. The team also has performed a failure analysis, which has not yet revealed any part that would have produced the behavior seen on the spacecraft, and has identified no part failures that would put the spacecraft at undue risk. With this assessment, the team commanded the spacecraft to gather more data on both the primary and back-up electronics. Those data were gathered on Dec. 29, 2010 and on Dec. 30, 2010, and are being analyzed. The results appear to show that the back-up electronics are not suffering from the same problem seen on the primary unit. Science operations will not resume until the first week in Jan. 2011, at the earliest, while the team assesses whether or not to switch to the back-up hardware. Meanwhile, the team is assessing delaying the next science data download, currently scheduled for late Jan. 2011, to minimize future data disruptions. This article was sponsored by Forensic Science Books. The Space Shuttle Program management team was provided a status Thursday on the continuing investigation, testing and analysis regarding shuttle Discovery's External Tank stringer crack issue. Following the rollback of Discovery's STS-133 stack to the Vehicle Assembly Building at NASA's Kennedy Space Center Wednesday, Dec. 22, engineers immediately began the work to continue evaluation of the intertank area of the External Tank. Since the rollback data analysis from a tanking test has continued to be reviewed along with “non-destructive evaluation” (X-rays) of stringers that were not accessible at the launch pad. The X-rays showed four additional small cracks on three stringers on the opposite side of the tank from Discovery, and managers elected to repair those cracks in a similar fashion to repairs made on cracks discovered after the Nov. 5 launch attempt. That work is estimated to take 2–3 days. Any further work will be evaluated thoroughly early next week after additional data is reviewed. The hardware is in place to perform any modification. That work would be performed inside the VAB. Managers continue to evaluate an option to perform known and practiced modifications on additional stringers. A decision may be made as early as Monday, Jan. 3. The next available launch date is Thursday, Feb. 3 at the opening of a window that extends through Feb. 10. The current preferred launch time on Feb. 3 is 1:37 a.m. EST. This e-mail update was generated automatically based on your subscriptions. Some updates may belong to more than one category, resulting in duplicate notices. The GOES series of satellites keep an eye on the weather happening over the continental U.S. and eastern Pacific and Atlantic Oceans and had a busy time with wild weather in 2010. 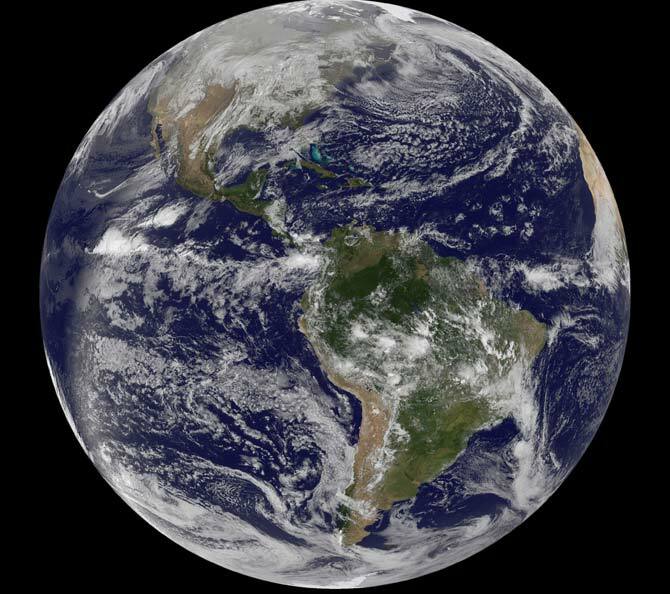 Today, GOES-13 captured one of the last images of North and South America in 2010 as the world continues to turn toward 2011. The Geostationary Operational Environmental Satellite called GOES-13 satellite captured a "full-disk image" of North and South America in an image created December 30 at 1445 UTC (9:45 a.m. EST) as the world awaits the new year. The stunning image shows cloud cover associated low pressure areas over the upper Midwestern U.S. and Colorado's Rocky Mountains. NASA's GOES Project, located at NASA's Goddard Space Flight Center in Greenbelt, Md., procures and manages the development and launch of the GOES series of satellites for NOAA on a cost-reimbursable basis. NASA's GOES Project also creates some of the GOES satellite images and GOES satellite imagery animations. NOAA manages the operational environmental satellite program and establishes requirements, provides all funding and distributes environmental satellite data for the United States. NASA's GOES Project was very busy this year. GOES-13 monitors the eastern continental U.S., Atlantic Ocean, Gulf of Mexico and Caribbean, while GOES-11 monitors weather conditions over the western U.S. and the Eastern Pacific Ocean. In 2010, GOES satellites were busy providing images and animations of weather systems from nor'easters to tropical cyclones that caused blizzards, flooding and wind damage. Most recently, the GOES project used satellite data to create an impressive animation of the great Christmas weekend blizzard that pummeled the northeastern U.S. Prior to that, GOES imagery showed travel conditions for the holiday weekend when that low was over the Colorado Rockies. On Dec. 19, the GOES-11 satellite captured an image of the famous "Pineapple Express." Occasionally in the winter, a large jet stream forms across the mid-Pacific, carrying a continuous flow of moisture from the vicinity of Hawaii to California, bringing heavy rain and snow to the Sierra-Nevada for several days. On Dec. 8 GOES-13 satellite imagery revealed a snow-covered, winter-like upper Midwest, several weeks before astronomical winter. On Nov. 24, GOES satellites helped Thanksgiving travelers figure out where delays may be happening. During the summer, on July 25, GOES-13 imagery tracked one of the most destructive storms in years to strike Washington, D.C. and the surrounding area. Strong winds downed trees and power lines, leaving hundreds of thousands of residents without power, stopping elevators, and darkening malls and movie theaters. Falling trees killed at least two people. The NASA GOES Project created a satellite animation of the storm as moved through the region. GOES-13 was busy in the Atlantic during the 2010 hurricane season. The Atlantic season started on June 1 and ended on November 30. The Atlantic season tied for third with two other years (1995 and 1887) as having the largest number of named storms at 19, and tied with two other seasons (1969 and 1887) for the second largest number of hurricanes, with 12. GOES-13 covered all of those tropical cyclones. GOES-11 didn't see the action in the Eastern Pacific tropics that GOES-13 did, however. Because of a La Niña event, the 2010 Pacific hurricane season (which began May 15 and ended Nov. 30) was the least active season in terms of the number of named storms and hurricanes on record. All tropical cyclones can be seen at NASA's Hurricane page archives for 2010 at: http://www.nasa.gov/mission_pages/hurricanes/archives/index.html. On April 14, months before hurricane season started, GOES-13 became the official GOES-EAST satellite. GOES-13 was moved from on-orbit storage and into active duty. It is perched 22,300 miles above the equator to spot potentially life-threatening weather, including tropical storm activity in the Atlantic Ocean and Gulf of Mexico..
Before GOES-13 moved into the position previously occupied by GOES-12, GOES-12 captured a parade of three large storms the flooded the upper Midwest and Northeast in the second half of March. In the first half of March, GOES-12 covered storms as they dumped heavy rainfall in the Northeastern U.S.
On March 12, GOES-12 captured a very rare event in the tropics: the second–ever known tropical cyclone called Tropical Storm 90Q formed in the South Atlantic Ocean off the coast of Argentina. During the first two weeks of February 2010, the GOES-12 weather satellite also observed a record-setting series of "Nor'easter" snow storms which blanketed the mid-Atlantic coast in two blizzards. Whatever and wherever the weather in 2011, the GOES series of satellites will always go. This article was sponsored by Police Technology. System 98S is currently bringing rains and gusty winds to the northwestern coast of Western Australia, and NASA's Tropical Rainfall Measuring Mission satellite spotted areas of moderate to heavy rainfall in the system. NASA's TRMM satellite captured an image of System 98S' rainfall when it passed overhead in space on Dec. 30 at 1310 UTC ( 8:10 a.m. EST ). TRMM is a joint mission between NASA and the Japanese space agency JAXA that can estimate rainfall in a tropical cyclone from its vantage point in space.The heaviest rainfall was occurring over the Southern Indian Ocean while light to moderate rainfall - up to 40 millimeters (mm) or 1.57 inches per hour - was occurring over land areas near Kununurra at that time. Kununurra is located in the heart of the Kimberley in Western Australia, one of the world's great wilderness areas. 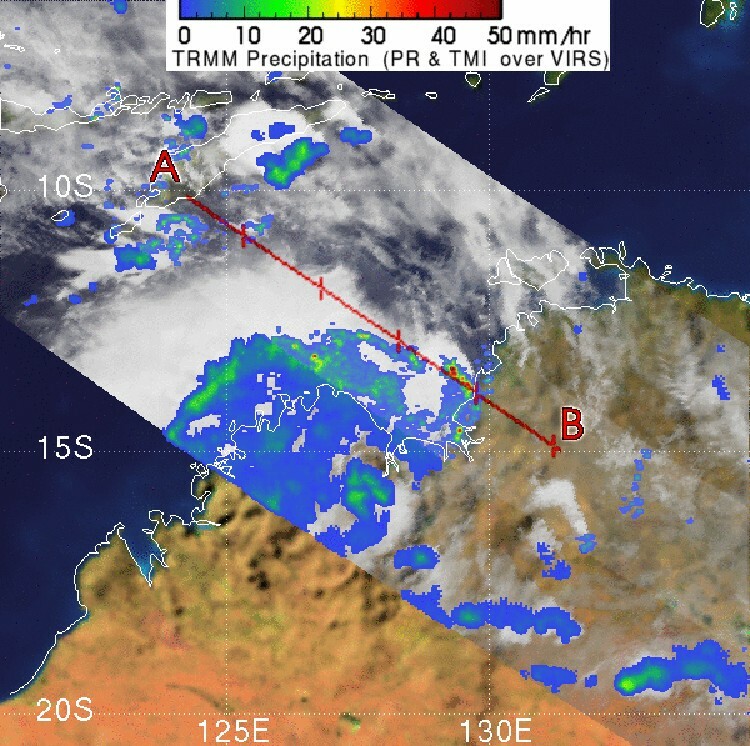 At 1200 UTC (7 a.m. EST or 8 p.m.) on Dec. 30, the center was near the border of the Northern Territory and Western Australia, about 30 kilometers (18 miles) northwest of Kununurra and 45 kilometers (28 miles) east southeast of Wyndham. It is moving west- southwest at 28 kilometers (18 miles) per hour. The Australian Bureau of Meteorology warns that coastal areas of the west Kimberley between Kuri Bay and Wallal including Broome can expect a period of strong winds and heavy rain overnight from Friday into Saturday morning. Heavy rainfall of 100 to 150mm (4 to 6 inches) is expected in the north and west Kimberley over the next two days as the system moves westward with significant rises in rivers and streams. Residents should be prepared for local flooding. System 98S is forecast to move to the west-southwest and move off the west Kimberley coast late Friday or early Saturday (local time) into the Southern Indian Ocean where it expected to strengthen into a tropical cyclone. By Sunday the system is likely to be north of Exmouth and continue to move toward the west. Further forecast updates and warnings can be found at: http://www.bom.gov.au/. MS: Thank you all for sticking with us here to the finish line of Grid Interop. With a snow storm impending, I'm sure everyone is anxious to get out this afternoon. But we have a real treat here, and it's my pleasure to introduce our keynote speaker, closing keynote speaker, Pat Gallagher, who I think many of you know because Pat was the opening keynote speaker a year ago in Denver when we launched the SGIP at Grid Interop. And so I'd like to welcome Pat back to reflect on what's happened over the last year and what's ahead. For those of you who don't know Pat, he is the 14th Director of the National Institute of Standards and Technology. He was confirmed in November of 2009. Pat oversees a budget of roughly a billion dollars a year and 2,900 employees who are scientists, engineers, administrative, and support staff. Pat previously served as Deputy Director of the agency and before that Director of the NIST Center for Neutron Research. Pat has been very much involved in his career in science and technology policy issues, worked for a time in the Office of Science and Technology Policy at the White House, and currently serves as co-chair of the Standards Subcommittee of the White House National Science and Technology Council. And I can tell you that Pat has really brought a tremendous amount of change in terms of bringing the strategic importance of standards to the top of the radar screen in political circles. And as a result, I can tell you that NIST is not just a sleepy scientific back water of arcane subjects, but really at the center of a lot of very hot topics, not only the Smart Grid, but cloud computing, health care information technology, and it's really remarkable to see how the U.S. has turned around in terms of standards being sort of not on anyone's radar screen. PG: Good afternoon everybody. This is a real pleasure to be back. So I feel like I opened the first Grid Interop last year and am closing this one. We'll have to figure out what I do next year. Something in the middle. We'll have to see. It's a real pleasure to be back. I thought what I'd do today is share some thoughts about the journey we're on, on Smart Grid, talk a little bit about where we are and where we're going. I think it's particularly timely coming at the very end of a very busy workshop like you've had here. I can see the fatigue in everyone's eyes. I can tell you've been working hard all week. And it sounds from all reports that it's been extremely successful. I was getting a progress report from George. We have really remarkable progress. The Priority Action Plan Working Group 11 is recommending adding standards to the SGIP catalogue that cover electric vehicle charging. These standards, when finalized, are going to pave the way for the U.S. adoption, widespread adoption of electric vehicles in this country. The PAP Working Group 1 is looking at the ATF internet standard protocol suite. This is going to lay out basically all of the protocols that cover two-way communication between devices and the grid. This is a foundational achievement that's needed to allow this infrastructure to be developed. PAP 15 is looking at harmonizing two sets of standards dealing with coexistence; on broadband power line communications. This was an essential breakthrough. I understand that it was a tough, hard-earned breakthrough, and yet it was a very strong recommendation, including, this is the first time that a PAP has recommended making compliance with such a standard mandatory. Working Group 10 is evaluating the NAESB energy information usage standard. I can tell you this is an area of intense activity at the White House, because enabling customer interaction with energy usage data is seen as foundational to the acceptance of this technology. And here we have one of the core seed standards that basically sets the stage for this to take place. So, my hat's off to everybody here. You've earned all of the coffee and treats that you've had here, and hopefully you can get out of town before the snowstorm locks you in even longer. So what I thought I'd do is, we all know why Smart Grid is critically important. This is one of those rare confluences that doesn't happen very often where basically a technology infrastructure has two major achievements. One is, it can set the stage for us to address the nation's energy problems. It fundamentally enables a whole set of things, including more efficient and effective electrical distribution--making the grid more reliable, more secure, more effective. It enables widespread use of renewable power generation. It gives consumers power--it enables consumers to manage their energy use and it makes them smarter consumers in this space. But the President was really clear when he was running for office and has really focused on this: that this is also a case where that tackling and addressing that infrastructure need also creates enormous economic opportunity. This is a chance to create jobs, to set up industries. And we know how powerful this is. If you think back a century and a half when this country set out to deploy and build its railroad infrastructure, I'm sure it was motivated at that time by the need to open up this great American West and move goods and people, but we know it fundamentally rewrote what our country looks like. And I think the understanding is that these infrastructures are enormously powerful and Smart Grid really does have the same potential. We were talking earlier, this really is a disruptive technology, and it's going to be fascinating to see how this disruption takes hold. So I thought it would be very interesting for us to step back and look at the history, where we've been. And this is sort of a government-centric history, so you all, I will apologize from the beginning. But three years ago Congress passed a piece of legislation called the Energy Independence and Security Act, which among other things, set up the roles and responsibilities of several agencies, including NIST. I have to tell you when that piece of legislation was passed, we didn't all drop what we were doing and start working on this. It was a much more gradual process. In fact, in many respects in hindsight it was moving too slowly. But there was a lot of ground setting that was going on in terms of starting to identify the moving parts and starting to pull together groups of experts and beginning to address this. And then about two years ago, two things happened that were critically important, and, in fact changed the whole picture. One of them was a Presidential election, and the other one that was occurring at the exact same time was the onset of this great recession that we've experienced. And the response to the recession included a major piece of legislation called the American Recovery and Reinvestment Act, the Stimulus Bill that we talk about. But actually it was not just stimulus, it will also reinvestment. It was also addressing long-term growth. And that bill made substantial investments in the infrastructure of this country. And one of the key pieces of infrastructure was the modernization of the electrical grid. And so at that time, DOE was about to invest well over $4 billion into this area, and I think I shared the story with you last year, Secretary Chu, recently confirmed, was calling me at NIST saying "where are the standards"? This has got to move faster, we can't make these investments and be in front of these technical standards. And we all remember Secretary Chu, Secretary Locke convened a group of 70 leaders and executives from industry and from utility companies and said "I need your commitment to engage in this effort and move this as fast as we can." That kicked off a very, very busy effort. Many of you were involved in this. It was at the time, in hindsight, very ad hoc in the sense that George Arnold came in, and we started this effort to develop a road map. The first thing you do when you are going to march off is decide where you're marching, developed a road map, set some priorities, identified some early standards, some early victories, and really set the stage to move forward. And then last year, we kicked off a new phase in this effort, which was the transition from basically this planning phase to the beginning of what I would call normal operations. It was the stand up of the SGIP and the understanding that these standards, this technology that we're working on is not static. This is a dynamic set of technologies. And the way we were going to address this was through a public-private partnership. And we were going to set up the mechanics to do this correctly. And so a year ago, in Denver, I was talking to you and we were announcing the stand up of the SGIP. And today I would say this is going to continue to evolve. We've added some, and I'm going to show, highlight a couple of achievements that we can all look to, but it continues to evolve, and one of the signs of that evolution is that the White House, there is also now, and George is the co-chair of this with Pat Hoffman from the Department of Energy, a National Science and Technology Council Subcommittee on Smart Grid. Now you shouldn't confuse a proliferation of committees at the White House as an indication of progress necessarily, but this one, in particular, is a sign of the importance of this effort and the fact that it intrinsically cuts across a lot of agency lines. And it was viewed as imperative that we have the machinery, we have the vehicle for these agencies to work effectively and efficiently together to tackle both the acceleration of the standards effort that we're working on, the investments that are being made to support this, but all of the related issues that come up when you're dealing with an infrastructural effort of this scale. And so it's another sign that we continue to evolve and mature. So if we look at what we've accomplished so far, I think we can take a little moment to quietly celebrate. We have finalized and published the first version of the interoperability framework. We have the road map that will guide us as we focus on the details of this enormous effort. We've issued cyber security guidelines, which are designed to protect the two-way communications and ensure the integrity and trust in this infrastructure. In fact, without that, if we undermine that trust in this infrastructure, the system will not be what it needs to be. We've established collaborations with partners in other countries. In my view a foundational and critical component, Smart Grid moved immediately into an international effort, and I think this is essential so that not only we work together because this is a problem that, frankly, doesn't stop at anyone's borders, but it means we can also move efficiently towards a set of truly international standards so that manufacturers all over the world have the benefit of a worldwide market. We've identified the first set of standards that are ready for regulators to begin considering. So we're now beginning the process that the Energy Independence and Security Act envisioned over three years ago, which is this relationship between technical standards setting and regulation. And we're at the beginning of that journey. And we've developed this robust process that you've been sweating over all week, which are these priority action plans where we look at the critical gaps in the standard setting and we put together teams to address those gaps as urgently as possible. And this is a tough challenge. There's the old adage that if everything is a priority, then nothing is a priority. And yet there are a lot of things that we have to do. So I think this process of identifying a critical subset of true priorities and putting action teams together to address them has been remarkable. And the successes are quite equally remarkable. These efforts have led to upgradability standards for meters, to ensure that our investments are not stranded and meters can improve as the technology improves. We have a standard for energy usage data that we talked about before that will go into the catalogue of standards for the SGIP. This will set the stage for applications so that consumers can now move to actually managing their energy use in a real way. And it opens up new commercial opportunities for development of these tools by third parties. Standards for electric vehicle connection and charging will also move forward. A guide for internet protocols so we can begin to look at all of the communication technologies that will tie these components together--this is vital for the two-way communication among the devices on the grid, and the coexistence standards for power line carrier signals. So this is pretty impressive. And I hope you feel that sense of accomplishment. I think this whole audience should be thanked for your efforts on this. There are a few people I would like to single out. The Plenary Officers: Steve Widergren, I want to thank you, and Mark Klerer and Paul Molitor. The Architectural Committee and its chair, Ron Ambrosio. The Testing and Certification Committee: Rick Drummond, Dean Prochaska, and Tobin Richardson, and the SGIP Governing Board and its chair, John McDonald and vice chair, John Caskey and secretary, George Bjelovuk. There are many, many others. Those of you working at chairing and leading the Priority Action Working Groups--those group members and technical experts--I wish I could read all of your names today, but I want to extend my appreciation for your efforts and for your commitment to this project. So that's sort of the journey we've been on. What I thought I would do is sort of reflect a little bit on where we're going to head from here. And, in particular, it's going to be an interesting time because it's also a point where we're going to begin to see some of the results of our work. I think to characterize, there's been a lot of talk about valleys of despair and peaks of bliss and things of that type. But rather than use that terminology, let me use the analogy that a year ago we were in the design phase. We were designing a process that we were going to use to work with each other. And design phases are exciting; we've got architectural drawings and we can see what it's going to look like, and no one's gotten dirty yet. It's kind of fun. Right now we're at the construction phase, and we're in the mud pits, and we're shoveling, and it's hard work. But this is actually where it becomes reality. And I actually think this is the point of the process where most of the dividends of our effort are going to be set, where we really are setting the stage for success. It's also the point sometimes where it's hard to keep your eye on the ball because you're no longer looking at the design drawings, you're down in the ditches working. So it's going to be a critical time. And as I said last year, the goal we're after is not the completion of our work, but the achievement of a process where our ongoing work is basically made routine and we can continue to work effectively together, because as long as technology improvements can happen, this is not going to be static at all. In fact, one of the challenges that not everyone who engages in this fully understands that we have so many participants in this process, the realization that this standards effort touches things like regulation, this standards effort touches policy. We have to also educate regulators and policy makers how this works and to expect this dynamic and ongoing process. And that's going to be a key part of our work and something that we're already beginning to see as we move forward. This is also a point in the process where we do start to see the fact that tackling an effort of this magnitude does create enormous economic activity. To give you some examples, one: we're already seeing results that Smart Grid technology, in fact, does have many of the things we were saying it would do a year ago. Results from several demonstration studies are now showing that Smart Grid technologies perform as intended, saving customers money and easing strain on the power grid. We started this effort believing that was the case. In Washington State, for example, the GridWise Olympic Peninsula Project managed by the Pacific Northwest National Laboratory and funded by DOE has tested Smart Grid technologies in more than 100 homes as well as with several commercial and municipal partners, and after one year consumers were saving approximately 10 percent on their electrical bills, in spite of the fact that utility costs were increasing and the fact at the same time peak demand in this area fell by 15 percent. This is a good omen. This means these technologies, in fact, worked as we thought. The Brattle Group consulting firm estimates that over the next 20 years the U.S. will be spending on the order of one and a half to two trillion dollars modernizing its electricity system. Now a lot of that is going to go to the large aging power plant and power generation infrastructure, but approximately a third--about 600 billion--will be spent on the modernizations associated with the grid and transmission. This is a major investment. The Grid Wise Alliance estimates that the Smart Grid will also put back into the economy about $1.8 trillion, largely through cost avoidance, by reduced energy usage and improved reliability of the system and by the fact that this new infrastructure means that the planned repairs on our old infrastructure won't be required. That's about $70 billion looking 20 years down the road. So there are immediate payoffs already there. The International Energy Agency estimates that worldwide, $13 trillion will be spent globally to modernize the world's power grids between now and 2030. This is the market that we're talking about. This is a tremendous opportunity not only to move the world towards a cleaner and greener set of technologies, but also to drive economic growth and to create opportunities for those that manufacture, sell, build, and install this equipment. These jobs will number in the hundreds of thousands. KEMA--another consulting firm--estimated last year about 140,000 new jobs will be created in the Smart Grid just in the United States. We're already beginning to see this happen. The Department of Energy awarded $100 million for 54 Smart Grid workforce training programs to help prepare the next generation of workers in the utility and electrical manufacturing industries get ready for this new technology. And according to the estimates of those companies winning these awards, these programs alone will train 30,000 American workers. The news, it's hard to read the news recently and not realize that there are planned, significant investments in Smart Grid transmission capability. There's been news, press releases about offshore wind generation grids and also grids to handle large solar farms. The 400-megawatt BrightSource complex now under construction in the Mojave Desert, that power generation project alone is going to create, has already created about 1,000 construction jobs and will create another 100 long-term facility management jobs when it's completed. So you already begin to see the front end of this enormous set of economic activities. So these are just a few examples. I think now what we need to do is focus on how do we set the stage for continued success. And in my mind, there are sort of four overriding goal areas that we should focus on. One is we have to empower consumers. The benefit of these technologies has to be visible to those that use the technologies. To sustain the investment, to make the business model work that has to be the case and so empowering consumers has to be a critical activity. We have to continue to spur innovation and open markets. The standard setting that we're involved in fundamentally enables new ideas and new opportunities to take hold, and that has to continue to be a priority. We have to continue to facilitate regulators as they go about their task of adopting this and integrating our work into their work, and we have to strengthen the international ties that are so critical to this effort. Let me give you an example. The standards for appliances to communicate with the grid that are, are necessary now for the appliance manufacturing industry to move forward. There is a danger in not having the standards ready. The appliance industry is ready to go forward with its plans to introduce smart appliances that react dynamically to pricing information and congestion information that they receive from the grid. These appliances will react not only during periods of peak demand, but any time, so that they can automatically adjust their energy usage accordingly. Without a unit, a set of effective national standards, this simply can't happen. We have to continue to leverage the work that's underway to make this, to move this work forward. We have to work on a testing and certification framework so that the standards development we do, in fact, are translated into meaningful use. The first candidates for implementation are in the areas of substation automation, grid monitoring, and control communications. Getting this right is important because it sets the conditions for market acceptance that are so important to this technology. Consumers and the public need the tools to manage their energy more effectively. This includes not only the technology that we're working on, but also, frankly, education. They need to understand in plain language what these tools will enable them to do, and that effort has to continue. And we must continue to engage international players in the Smart Grid arena, and frankly, I think this is going to continue to grow dramatically. I want to point out that Secretary Locke will be making a number of important international trade missions in the coming year. Innovation, technology, and trade are all linked. The trade balance of the United States is driven positively by our export of high technology, and Smart Grid is a key enabler in this. International standards are an important part of the equation. We are working to collaborate internationally wherever possible, because this stimulates innovation. It spurs efficient and effective competition to lower cost for suppliers, utilities, and consumers. International standards also allow Smart Grid products developed by U.S.-based companies to be sold around the world. It opens up markets. We want to maximize the opportunities of those companies who are innovating and developing new technologies and employing Americans so that they can design, build Smart Grid products and systems and sell them wherever they are being built. And we want to be, frankly, a net exporter of Smart Grid products and systems. We don't want to simply outsource this and import all of our needed technology. So this is critically important. I think the work that we've done thus far has been a critical first step. I think we have the mechanisms in place to continue to work together. And it's clear from the results from this week that, in fact, we've got the right group here to move these difficult technology challenges forward. MS: Dr. Patrick Gallagher was confirmed as the 14th Director of the U.S. Department of Commerce's National Institute of Standards and Technology, NIST, on November 5, 2009. Dr. Gallagher provides high-level oversight and direction for NIST. The agency promotes U.S. innovation and industrial competitiveness by advancing measurement science, standards and technology. NIST's fiscal year 2010 resources include $856.6 million from the Consolidated Appropriations Act of 2010, $49.9 million in service fees, and $101.5 million from other agencies. The agency employs about 2,900 scientists, engineers, researchers, technicians, support staff, and administrative personnel at two main locations in Gaithersburg, Maryland, and Boulder Colorado, in addition to other locations. Dr. Gallagher had served as Deputy Director since 2008. Prior to that he served for four years as the Director of the NIST Center for Neutron Research, NCNR--a national user facility for neutron scattering on the NIST Gaithersburg campus. The NCNR provides a broad range of neutron diffraction and spectroscopy capability with thermal and cold neutron beams, and is presently the nation's most-used facility of this type. Dr. Gallagher received his Ph.D. in physics at the University of Pittsburgh in 1991. In addition to his recently acquired enthusiasm for forensic science, his research interests include neutron and X-ray instrumentation and studies of soft, condensed matter systems such as liquid, polymers, and gels. In 2000, Dr. Gallagher was a NIST agency representative at the National Science and Technology Council, NSTC. He's been active in the area of U.S. policy for scientific user facilities and was a chair of the Interagency Working Group on Neutron and Light Source Facilities under the Office of Science and Technology Policy. PG: Good morning, everybody. I can tell it's a Monday morning. It's also a distinct pleasure for me to join you this morning and kick off, I like the brave tone of the first annual, this shows the intention to keep this going, but this is actually a remarkable event to get two long-standing collaborators, the National Institutes of Justice and the National Institute of Standards and Technology, to have a joint symposium, a conference to share information and to build the deep research ties that we need to work closely together. And so it's a pleasure for me to join you today, both as co-host and as a participant this morning to kick this off. NIST and NIJ, in fact, have a long tradition of working together, going back as John [Laub] pointed out, nearly 40 years now. And I think that you're going to hear through the next three days a lot of highlights, progress reports, and hopefully deep discussions about these many areas. I think it's actually no surprise that we would find ourselves in such strong collaboration--NIJ with its mission to foster science that advances the practice of law enforcement, and NIST, which is the nation's measurement laboratory--it would be natural for us to find a deep set of issues to work closely on together. And I think you're going to hear a lot of this interesting work over the next three days. In fact, I find it interesting, the history with NIST in forensic science actually goes back nearly to our founding. NIST is one of the nation's oldest national laboratories, founded in 1901 as the National Bureau of Standards, which many folks still remember us by the previous name. And in fact, going back at that time, it actually started to function immediately by 1912 as the nation's first criminal crime laboratory. In particular, Wilmer Souder was the scientist with the National Bureau of Standards and became one of the early scientists doing forensic science, in fact, I guess his real claim to fame, his most famous case was helping to identify and convict Bruno Hauptmann for the kidnapping of Charles Lindbergh's baby in 1932. Souder also then worked with the FBI to establish their crime laboratory in 1932. So it's a remarkable history going all the way back really to the roots of NIST, and again, should serve as no surprise that these two agencies work so closely together. So my job this morning is to tell you a little bit about NIST and make a few comments hopefully to stimulate your thinking in terms of what we do and how we can work together. NIST was founded actually as part of the Treasury Department only because it predated the founding of the Commerce Department. As soon as Commerce was founded, the National Bureau of Standards moved to the Commerce Department where we have been ever since. And as I said we are really thought of as the nation's measurement laboratory to promote U.S. innovation and industrial competitiveness by advancing measurement science, standards, and technology. Addressing national needs through measurement science has always been a key part of the NIST mission, whether that's forensic science as we heard about, or whether that's work on the war efforts during World War II, or whether that's work on the World Trade Center investigation after 9/11, NIST has always been called to apply its expertise in measurement science to address critical national problems. In my view this call, this recent call to address and strengthen the forensic science infrastructure of the United States is one of those needs. And that explains my renewed enthusiasm for forensic science, Mark [Stolorow]. So NIST, to think of us programmatically, the best way to do it is that we have four major program areas. The largest and most significant in terms of resources and personnel is the NIST Laboratory Program. I'll talk a little bit about that. That's what most of the people who work at NIST do. And it also explains most of the facilities that you see around us. We have two major campuses. The largest is the one you're on, here in Gaithersburg, Maryland. We also have another laboratory in Boulder, Colorado. And we also have a series of joint institutes with universities and other organizations and a few other locations around the country. But we also have three programs that are extramural programs that work primarily through grant programs outside of the agency. The first of these is the Hollings MEP Program where NIST provides funds to a set of centers for small and midsized manufacturers across the United States. This is part of our mission to promote competitiveness. We also sponsor the Baldrige Performance Excellence Program, which recognizes top performing organizations in terms of how they manage and perform. And the Technology Innovation Program, which funds high-risk, high-payoff research in areas of critical national need. And many of those calls have been in areas of advanced manufacturing. The Laboratory Program is probably going to be what your conference focuses on, because that's really the measurement science tie that we have in this area. And we recently reorganized at NIST, and the best way to think of our laboratory programs now is really in three major theme areas. NIST has a mission to promote and advance the state of the art in measurement science. It does that primarily through two laboratories--a physical measurement laboratory and a material measurement laboratory--that specialize in cutting-edge research at the forefront of making measurements, either physical measurements on physical quantities or in characterizing materials. The way that research is often translated to action, a key element of NIST work, is through measurement standards. We disseminate best practices protocols, and we also provide the measurement infrastructure that underpins accurate measurements from measurement standards to traceable quantities, calibration reference materials, things of that type. And, of course, that has deep ties with the work you're going to be talking on. NIST also has two laboratories that specialize in areas of technology. Our Information Technology Laboratory and our Engineering Laboratory focus on systems of technologies in broad areas. So, for example, the Information Technology Laboratory supports work in advancing cyber security for federal IT systems, usability research for IT, large data sets--much of the work that you're familiar with in that area: cloud computing, electronic voting, things of that type. Our Engineering Laboratory also supports technology systems in fire research, in advanced buildings, in construction, advanced manufacturing, things of that type. One of the key areas where that research effort is disseminated is through documentary standards--working with industry consortia to develop standards that address interoperability of the performance of these technology systems. In the United States, of course, these documentary standards are the responsibility of industry not of government, so our role in that case is really to work with industry to develop strong technical and science-based documentary standards. And again, technology plays a key role in forensic science and so there's a deep involvement with those two laboratories as well. And finally, we have a series of national user facilities. These are collections of measurement capability that are unique or hard to replicate at this scale, and when Congress appropriates funding to do this, it often comes with the mandate that we provide these measurement services nationally, usually on a merit base. So we have two of these major facilities. One is the Center for Neutron Research, which is a reactor base facility here on this campus. It specializes in using the reactor to generate neutrons, which probe the properties, both chemical and structural properties of materials. That program, too, has had a role in forensic science in the past, in particular, trace chemical analysis. And the Center for Nanoscale Science and Technology, which is a collection of capabilities that we have to study nano materials. And again, these six laboratories are spanned primarily on our two campuses. So let me just make a few final remarks on where we are in forensic science. From a policy perspective, everyone's attention was caught by the forensic report issued by the National Research Council in 2009. It's easy to catch everyone's attention when you have a harshly worded report. But it was an interesting report in the sense that it illuminated basically a call for action on how to strengthen the scientific underpinnings of forensic measurements and made a number of recommendations that Mark [Stolorow] has already talked about. It also specifically brought NIJ and NIST into its both discussions and recommendations. So I think it's timely for us to continue to focus on this and to, in particular, look at the way that we strengthen the role of standards in disseminating and underpinning forensic measurements with the best possible methodologies and to use this first annual conference as a way of initiating this discussion and how we take strong steps to strengthen these programs, just as this report is causing us to take looks both within our two agencies and how we strengthen and realign these programs. The other interesting thing about this from a policy perspective is the fact that the signature recommendation, which was basically to blow everything up and start over with a new agency, is likely not to happen. And what that means instead is that it calls for very strong leadership at the interagency level to come up with a series of recommendations that meet the requirements, in other words, the functional need that that report was calling for, even if the solution that was put in place isn't going to be the solution. And one of the key ways this has being done is at the White House level through the infrastructure known as the National Science and Technology Council. The National Science and Technology Council is basically the analog of the National Security Council or the National Economic Council. These are devices used within the White House to bring together the agencies to work together on a particular problem, and the working level, the full National Science and Technology Council, is chaired by the President and is comprised of the Cabinet. But that's not where they're discussing forensic science. It's done through a series of working groups and key among these, in fact, one of the most active has been this subcommittee on forensic science currently under way within the NSTC. And while their work is still ongoing, and this is an interagency process, so it's not a public process, this is going to play, whatever it says, is going to play a key role in framing the actions of the government in a coordinated way across multiple departments. So this is going to be very important. Meanwhile, we're going to, at NIST one of the things that you're going to hear about is that as I alluded to earlier, the forensic science activities are really spread across all six of our laboratories; it's not housed in any one particular area. To address that, the Office of Law Enforcement Standards plays a critical role in coordinating the activities across all of our laboratories in providing both the national visibility of its program and the essential internal coordination of its efforts, and you're going to hear a lot about these particular areas over this conference over the next few days. MS: Thank you very much Drs. Laub and Gallagher for your introductions. While we have them present on-site, we thought we would take some opportunity for questions and answers of these two distinguished guests. And this is the opportunity to ask any questions pertaining to forensic science at NIJ or at NIST. Are there any questions that you'd like to direct to Dr. Lob or Dr. Gallagher? Yes, sir? Technicians in the Vehicle Assembly Building at NASA's Kennedy Space Center in Florida are essentially done with the latest round of X-ray type image scans of space shuttle Discovery's external fuel tank. The computed radiography images of all 108 support beams, called stringers, on the outside of the external tank’s intertank section, which technicians began taking Sunday, are being evaluated by engineers. However, preliminary analysis indicates small cracks were detected on the tops of three stringers on panel 6, which is on the opposite side of the tank from Discovery. The newly detected cracks currently are under evaluation and there has been no decisions on what affect, if any, the these cracks will make on future plans. The new data, along with previous testing and analysis, will help engineers and managers determine what caused other small cracks on the tops of two stringers during Discovery’s launch countdown on Nov. 5. Space Shuttle Program managers are meeting this afternoon to decide whether testing and analysis indicate modifications are needed on some of the stringers. If required, modifications would begin next Monday (Jan. 3). An influx of invasive species can stop the dominant natural process of new species formation and trigger mass extinction events, according to research results published today in the journal PLoS ONE. The study of the collapse of Earth's marine life 378 to 375 million years ago suggests that the planet's current ecosystems, which are struggling with biodiversity loss, could meet a similar fate. Although Earth has experienced five major mass extinction events, the environmental crash during the Late Devonian was unlike any other in the planet's history. The actual number of extinctions wasn't higher than the natural rate of species loss, but very few new species arose. 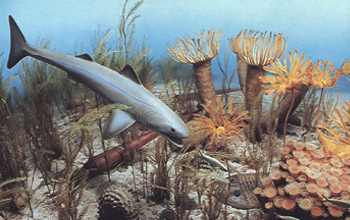 "We refer to the Late Devonian as a mass extinction, but it was actually a biodiversity crisis," said Alycia Stigall, a scientist at Ohio University and author of the PLoS ONE paper. "The knowledge is critical to determining the cause and extent of mass extinctions through time, especially the five biggest biodiversity crises in the history of life on Earth. It provides an important perspective on our current biodiversity crises." The research suggests that the typical method by which new species originate--vicariance--was absent during this ancient phase of Earth's history, and could be to blame for the mass extinction. Vicariance occurs when a population becomes geographically divided by a natural, long-term event, such as the formation of a mountain range or a new river channel, and evolves into different species. New species also can originate through dispersal, which occurs when a subset of a population moves to a new location. In a departure from previous studies, Stigall used phylogenetic analysis, which draws on an understanding of the tree of evolutionary relationships to examine how individual speciation events occurred. She focused on one bivalve, Leptodesma (Leiopteria), and two brachiopods, Floweria and Schizophoria (Schizophoria), as well as a predatory crustacean, Archaeostraca. These small, shelled marine animals were some of the most common inhabitants of the Late Devonian oceans, which had the most extensive reef system in Earth's history. The seas teemed with huge predatory fish such as Dunkleosteus, and smaller life forms such as trilobites and crinoids (sea lilies). The first forests and terrestrial ecosystems appeared during this time; amphibians began to walk on land. As sea levels rose and the continents closed in to form connected land masses, however, some species gained access to environments they hadn't inhabited before. The hardiest of these invasive species that could thrive on a variety of food sources and in new climates became dominant, wiping out more locally adapted species. The invasive species were so prolific at this time that it became difficult for many new species to arise. "The main mode of speciation that occurs in the geological record is shut down during the Devonian," said Stigall. "It just stops in its tracks." Of the species Stigall studied, most lost substantial diversity during the Late Devonian, and one, Floweria, became extinct. The entire marine ecosystem suffered a major collapse. Reef-forming corals were decimated and reefs did not appear on Earth again for 100 million years. The giant fishes, trilobites, sponges and brachiopods also declined dramatically, while organisms on land had much higher survival rates. The study is relevant for the current biodiversity crisis, Stigall said, as human activity has introduced a high number of invasive species into new ecosystems. In addition, the modern extinction rate exceeds the rate of ancient extinction events, including the event that wiped out the dinosaurs 65 million years ago. "Even if you can stop habitat loss, the fact that we've moved all these invasive species around the planet will take a long time to recover from because the high level of invasions has suppressed the speciation rate substantially," Stigall said. Maintaining Earth's ecosystems, she suggests, would be helped by focusing efforts and resources on protection of new species generation. "The more we know about this process," Stigall said, "the more we will understand how to best preserve biodiversity." The research was also funded by the American Chemical Society and Ohio University. This Hubble Space Telescope image of galaxy NGC 1275 reveals the fine, thread-like filamentary structures in the gas surrounding the galaxy. The red filaments are composed of cool gas being suspended by a magnetic field, and are surrounded by the 100-million-degree Fahrenheit hot gas in the center of the Perseus galaxy cluster. The filaments are dramatic markers of the feedback process through which energy is transferred from the central massive black hole to the surrounding gas. The filaments originate when cool gas is transported from the center of the galaxy by radio bubbles that rise in the hot interstellar gas. 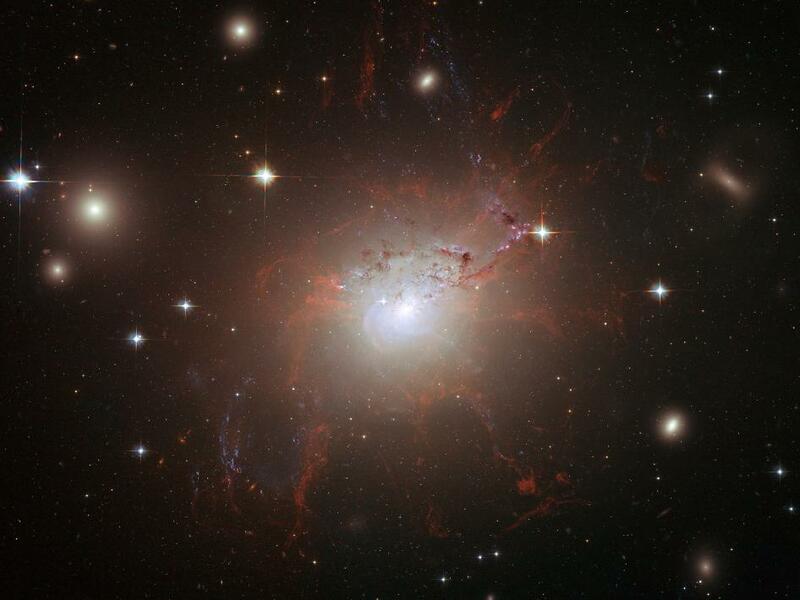 At a distance of 230 million light-years, NGC 1275 is one of the closest giant elliptical galaxies and lies at the center of the Perseus cluster of galaxies. The galaxy was photographed in July and August 2006 with Hubble's Advanced Camera for Surveys. WASHINGTON -- NASA is seeking applications from graduate students for the agency's new Space Technology Research Fellowships. Applications are being accepted from accredited U.S. universities on behalf of graduate students interested in performing space technology research beginning in the fall of 2011. The fellowships will sponsor U.S. graduate student researchers who show significant potential to contribute to NASA's strategic space technology objectives through their studies. Sponsored by NASA's Office of the Chief Technologist, the fellowships' goal is to provide the nation with a pipeline of highly skilled engineers and technologists to improve America's technological competitiveness. NASA Space Technology Fellows will perform innovative space technology research today while building the skills necessary to become future technological leaders. "Our Space Technology Graduate Fellowships will help create the pool of highly skilled workers needed for NASA's and our nation's technological future, motivating many of the country's best young minds into educational programs and careers in science, technology, engineering and mathematics," said NASA Chief Technologist Bobby Braun at the agency's Headquarters in Washington. "This fellowship program is coupled to a larger, national research and development effort in science and technology that will lead to new products and services, new business and industries, and high-quality, sustainable jobs. Fellowships will be awarded to outstanding young researchers and technologists positioned to take on NASA's grand challenges and turn these goals and missions into reality." The deadline for submitting fellowship proposals is Feb. 23. Information on the fellowships, including how to submit applications, is available at http://www.nasa.gov/offices/oct/early_stage_innovation/grants/NSTRF.html. To learn more about NASA's Office of the Chief Technologist and the crosscutting space technology areas of interest to NASA, visit http://www.nasa.gov/oct. I realize that it’s past Thanksgiving, but I’m still thankful, thankful for the New Year holiday and the recent New England weather that’s forcing us to chill out. With the increasing pace of modern life, would we find time otherwise for a self check-in? When planning your New Year, consider that healthy resolutions easily partner with helping the environment. If we all make one change in 2011, it should be to simply think about the impacts our choices have. Get Inspired: Get outside and find your environment; a place to help protect for the future, just like someone did for you. Decide to Act: Simply thinking about your purchases and where they came from is the right start. Our actions and our choices generate a domino effect beyond what we see, so make choices for a positive one. Share and Maintain: Talk to friends and family, learn from others and keep it up! Simply talking about the environment spreads awareness; you never know who else you’ll inspire! •Think about your water and where your drain drains! Water Choices #2 & #3 Keep water clean by using biodegradable products, and remember don’t flush medications! •Learn about local food and produce, challenge yourself to a weekly recipe with a locally grown or organic ingredient. Air Choice #4 Buy locally, or grow your own. Reduce air pollution caused by food and goods transport. •Exercise goals can cut back on car exhaust. Go car-free or consolidate errands with friends. Air Choice #1 Use human power to get from A to B! •Lift at the gym, and keep our landfills slim and trim. Waste Choices #3 & #6 Cut back on your trash by recycling and buying items in less packaging to begin with. Learn about your recycling options in your city or town. If we counted our garbage like we count calories, would things be different? Label your trash bin “landfill” if you need a reminder! •Most importantly, talk to others. Compare ideas and involve kids, there’s no better way to get inspired. Advocacy Choice #9. About the author: Jeanethe Falvey works on the Pick 5 International program at the U.S. Environmental Protection Agency from Boston, Massachusetts. Supernova Bubble or Holiday Ornament?